Can the world stand yet another new currency? King Solomon reminds us that wisdom and prudence are far more valuable than money. But financial advisers and economists watching the rise of more and more new digital currencies like the brand- new Dogecoin wonder if these anonymous easy to create monetary systems are really prudent — of if they could affect the stability of the word’s money markets. The newborn Dogecoin, created just last December, has a lighter persona than the Bitcoin. Featuring a laughing Shiba Inu dog who spreads the word via rocket ship in promotional videos, the Dogecoin is an offshoot of the Litecoin, an early challenger to the Bitoin that has all but vanished. Like all digital currencies, Dogecoins can be mined by diligent computer users and then put into circulation. Mainly used so far for making tips and donations on social media, the Dogecoin gained a higher profile at the Sochi Winter Olympics, when the Reddit Dogecoin community raised the equivalent of $7,000 in just a few hours for the benefit of an Indian athlete. And the new coin is already being compared to Bitcoin in terms of performance and permanence. But the real story behind the Dogecoin is its origins. The brainchild of a former IBM engineer, the coin was created in December 2013, and its quirky, user friendly image has pushed it onto the international money stage in just two short months, thanks to the following it’s gained among social media users on sites like Reddit. The Bitcoin’s connection to the drug marketplace Silk Road and the recent arrest of a Bitcoin exchange executive have raised enough concerns among the worlds traditional big money market players to trigger government bans and shake the digital coin’s value. And according to some analysts, that could open doors for new “clean” digital currencies like the Dogecoin. And once that happens, then what? Another concern raised by economists and market watchers is that the ease of creating cybercurrency could result in a glut of alternative monies, backed by nothing, and each with its own sphere of users – a recipe for fragmenting the world’s currency systems. And as Jason Hartman points out, that could lead to a crackdown that kills the emerging move to democratize currency. 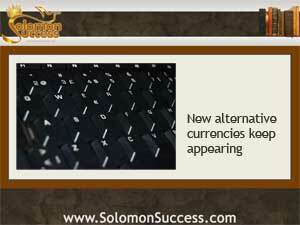 Digital Currency: Changing the World’s Financial Landscape?